Design thinking has been a hot topic over the past few years. You may hear the term all the time, but do you really know what it is? 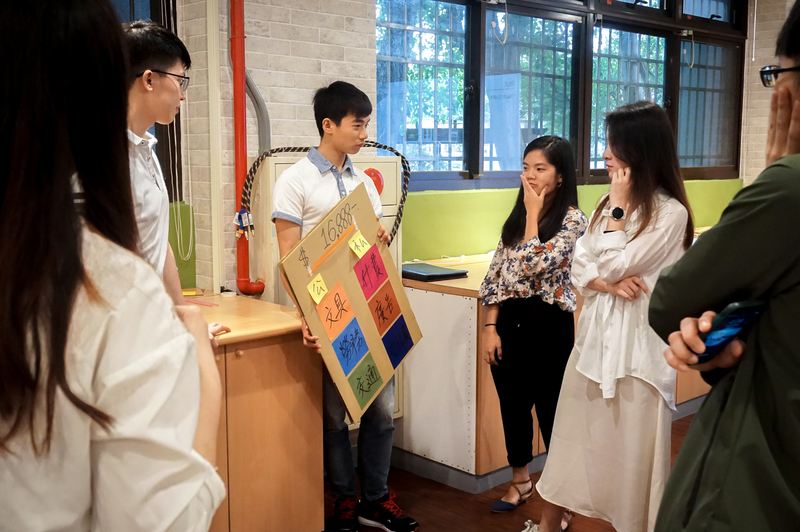 In this article, we will walk through a quick recap of a design thinking workshop (specially for startups) to explain the concept of design thinking with examples. Speaking of design thinking, the first thing that comes into many people's minds is "IDEO," an influential global design company. IDEO did not invent the idea, but rather, through practicing it, solve problems big and small, thus earning its fame as one of the top leaders in design thinking. According to IDEO, "Design thinking is a process for creative problem solving." Still pretty vague, right? Don't worry, follow us through our workshop and you'll start to grasp the idea. 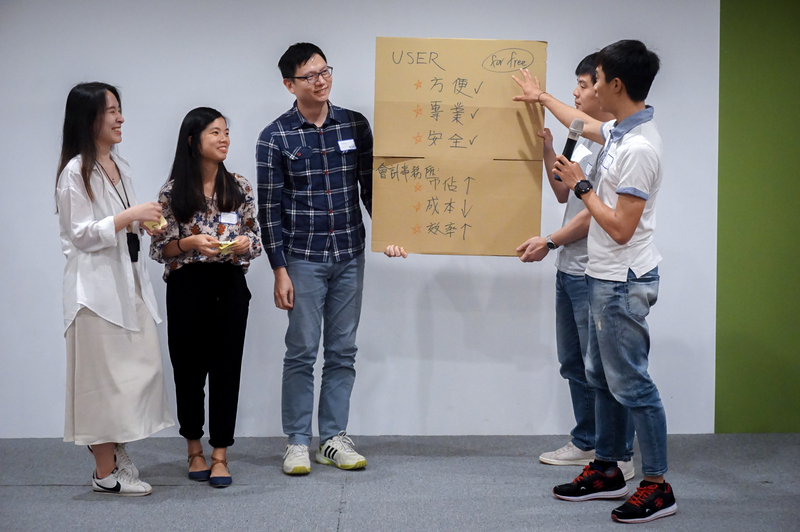 In this quick recap, you'll be able to learn (and hopefully feel the sparks of creativity in the air) what 40+ participants learned in a 3-hour design thinking workshop hosted by Jerry Chen, an experienced startup consultant with IDEO design thinking course certificate. 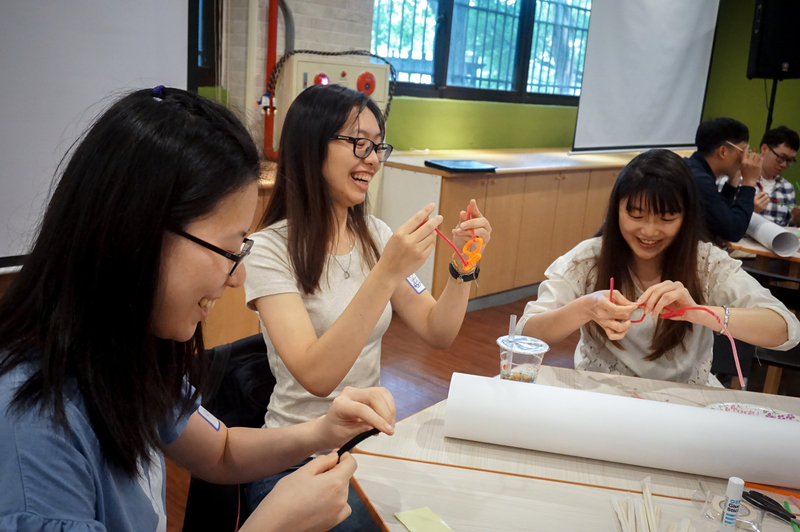 Participants were spurred through warm up exercises and a group project, and by the end of the workshop, the idea of design thinking was not only introduced but also practiced and hammered into them. Exercise 1 - Can you make a pair of glasses from scratch in 2 minutes? Here's your 1st task: handcraft a pair of glasses from scratch in 2 minutes. Ready? Go! Aaaand time's up! Whether you're satisfied with your outcome or not, put your glasses on. As you can see in the picture, people's definition and focus of glasses are very different. This spontaneous exercise reflects what many startup faces in their early stage - having to create a prototype quickly with very limited resources. "If a picture is worth 100 words, a prototype is worth 1000 meeting," Jerry quoted Tom and David Kelley. Exercise 2 - Finding demand from your users. In this follow-up exercise, Jerry asked participants to think about one person in their minds and tailor the glasses made in the last exercise for that person. "It could be your father, your girlfriend, your teacher - doesn't matter," Jerry said "I want you to think about one problem that they are faced with and solve it with this pair of glasses." Done? What feature did you added to your glasses? "I'm making this glasses for my father. He likes to watch TV late at night and postpones his bed time way too much. I've designed this curtain-like lid on this glasses that automatically covers his sight at a given time to force him to go to sleep. Hahaha." "This pair of glasses is for my teacher, who is really busy and rushes through the campus every day. The new feature that I added is a hat brim to protect him from the UV rays when he rushes through the campus. " Creating a prototype isn't the hardest part. For many companies especially startups, it's all about finding demand from users. Design thinking is a user-centric approach of creative problem solving. Sometimes we get too caught up in the process of product development and forgot WHY we're doing it in the first place - to solve a problem for our users. This exercise stresses the importance of finding demands. In the next 2 hours, Jerry put participants into groups to worked on a project. Participants were given a scenario and a problem to solve using the 5 stages of design thinking. 1. Empathize - Gain empathic understanding of the problem you are trying to solve from the perspective of your users. 2. Define - Utilizing the information put together from the last stage, analyze and define core problems that the team is trying to solve. 3. Ideate - Generate ideas with the insights gained in the last 2 stages. Get the creative juices flowing! 4. Prototype - As demonstrated in exercise 1, in this stage, the team should focus on creating inexpensive, scaled-down versions of the product. 5. Test - Test the product. Fine-tune or redefine if necessary. Working in groups, participants first started in a heated discussion of the problems user may faces in the scenario given. Jerry highly encourages the use of post-it notes, "Write everything down. Everything." In this stage it is important to include all possibilities for further analysis in the next stages. It is also important to have a diverse team because different perspectives could really spark creativity. Many seem to believe that design thinking is a technique for designers only, but that is not entirely the case. Bring in different teams into the discussion could reduce communication barriers between teams and hep evaluate problems more effectively from, say, technical perspectives and marketing perspectives, and integrate the ideas in the discussion. In this stage Jerry instructed participants to "arrange and group the post-it notes." To better set directions for the next stages, narrowing down and identifying the core problem(s) is key. Through empathizing, the team had a better grasp of what the problems were and how it was affecting users. In the defining stage, you want to re-frame and define the problems in a human-centric way. This is about priorities and allocating resources - you can do anything once you stop trying to do everything. It's time to create ideas! This is when brainstorming really comes in handy. "No idea is a bad idea," Jerry reminded everyone. The top goal here is to generate as much creative ideas as possible, so think out of the box and don't limit yourselves. It is important to keep in mind the conclusions drawn from the last 2 stages, however. Participants had a lot of fun during the process - creativity was in the air. "No idea is a bad idea." Turn words into action! Narrow down ideas from the brainstorming session and build a prototype to concretize concepts. Again, the goal of prototyping is to create inexpensive, scaled-down versions of the product for further testing. For perfectionists this may be a little bit uncomfortable, but product development can be a vigorously chaotic process - you could have a version you thought was great, discover a problem (through testing hopefully), and then go back to 0 again. Especially for startups, when resources are very much limited, it is important to focus solely on factors that matters to the core problems. Prototyping can come in many different forms - it could be a video, pictures, or even acting - as long as the ideas can be presented and understood. The final, but not actually the ending stage of design thinking. While working in groups, instructor Jerry had different groups test out each other's prototypes. In this stage, it is crucial to collect user feedback and spot blindspots that can help optimize the product. By now you probably have a basic understanding of what design thinking is and how it works. This technique or shall we say mindset, is a powerful tool for startups or anyone who has limited resources but seeks to maximize their influence and provide solutions that actually solve pain points. Design thinking is again, a human-centric approach to solving problems creatively. It is a start to creating a great product, but just like everything else, takes practice. Try this process with your team and feel the sparks of creativity! 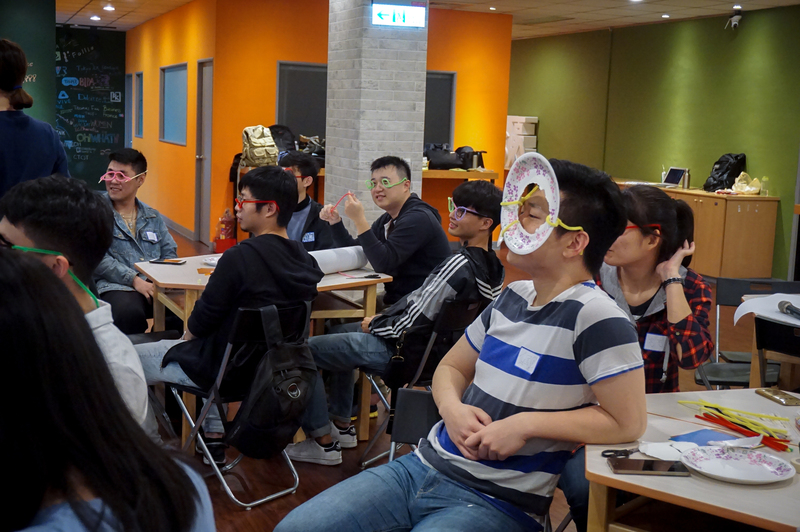 This article is a recap of a design thinking workshop hosted by SparkAmplify. This workshop is part of the topic "Spark Your Creativity," a series of workshops specially for startups hoping to share knowledge in different fields including design, marketing, data and development and help startups grow.